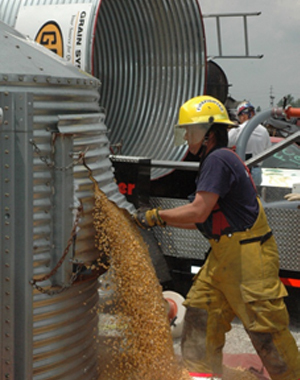 Through the generosity and foresight of Illinois' agricultural industry, the Illinois Fire Service Institute has established a special fund to support Grain Bin Rescue Operations training. The program, developed by IFSI, enables firefighters, other first responders and private sector rescue teams to get specific training on grain bin rescues. Contributions to the fund pay for the delivery of 40-hour classes delivered on weekends throughout Illinois to accommodate the schedules of volunteer firefighters and others who cannot afford to be away from home during the week. Expanding and modern on-farm and grain elevator delivery and storage systems expose farmers and grain system handlers to more chances for engulfment in bins. For the years 2009 through 2014, 226 grain engulfments nationwide accounted for 99 deaths. Quick and skilled response by firefighters can help reduce deaths and minimize injuries. The Illinois Fire Service Institute recognizes the need to provide firefighters and other first responders with the specialized knowledge to be effective in rural settings. It is especially important since nearly three-fourths of all Illinois firefighters are volunteers that work with part-time fire departments and fire protection districts. After submitting this online form you will be directed to the University of Illinois Foundation website where they will complete your transaction details.